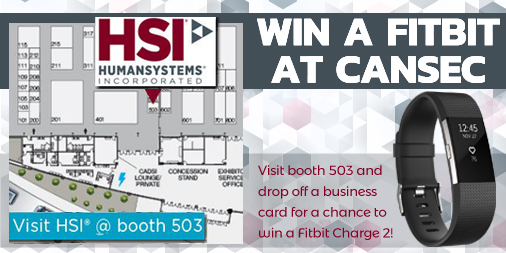 CANSEC – HSI® and YOUR CHANCE to win a Fitbit! CANSEC is fast approaching, on May 31-June 1st. For those of you who don’t know – CASNEC is Canada’s largest Global defence and security trade show. HSI® has been an exhibitor at CANSEC for over 10 years. Like every year before, we have some very exciting things happening at our booth (#503)! First and foremost, we are holding a contest to win a Fit Bit Charge 2 (valued at $200)! All you need to do is to visit us at booth #503, and drop off your business card in the bowl. It’s a simple as that. To learn more about our contest, and about how HSI® can help you and your organization make sure to follow us on Twitter and LinkedIn. Secondly, we will be showcasing a brand-new security eLearning module developed in-house. This module is beneficial for any company that requires annual security training to satisfy PWGSC security standards and requirements. Using interactive narrative as our design approach, we’ve transformed mandatory security training into an engaging and memorable experience for our learners – stop by our booth for a brief demo! Finally, feel free to come by and ask how we can improve your equipment to meet user needs. Along with our mannequin, we will be displaying several options of operational clothing at our booth. Extensive experience in anthropometry, user requirements, and needs analysis gives us a competitive edge when incorporating our knowledge into your clothing/soldier system designs. Make sure to visit us to hear all about what HSI® can do for you, and to see some of the new exciting things we have going on here! Chris Ste-Croix, Doug Palmer, and Eric Zwaniga will be there all day to answer all questions related to our Human Factors work, and how we can help you with things such as usability, needs requirements, anthropometry, procurement, analysis, testing and evaluation, and training and e-learning. Again, don’t forget to spread the word about #CANSEC2017, tag @HSI_Guelph to join the conversation, and follow us on LinkedIn. We look forward to seeing you all at CANSEC 2017! Tag us with #CANSEC2017 to join the conversation.